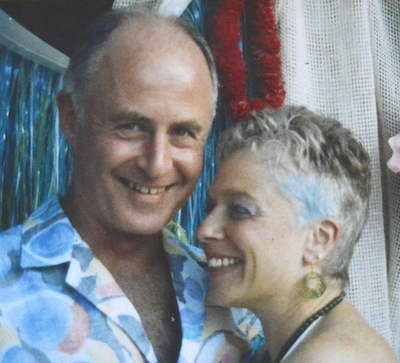 The first photo of Alan and Phyllis in 1987 when they were new in their relationship. My husband, Alan Alberts, and I began our relationship in February 1987 when we were both living in a small community in the foothills of California. I was 40 years old and Alan was 50 years old. We both had been married previously, and we each had one daughter. We came together with a foundation of shared values. We knew that if we cherished one another, we’d be able to make love happen and create a strong and meaningful relationship. We both valued learning, and we supported each other to become the best human beings possible. During our 26 year marriage, as our love grew and our lives evolved, we began to implement activities that were outgrowths of our love for one another. We developed and sustained a business and technology consulting partnership. We meditated together and enjoyed the deepening of our spiritual paths. We developed and performed storytelling-magic shows celebrating people’s lives. We improvised together on two side-by-side keyboards in our house. It was our deepest form of communication. We backpacked and camped together for fifteen years. And together, we took care of my mother during the last eleven years of her life when she lived with us. She died peacefully at 95 in her bed in our house. One of the most loving aspects of our relationship, and the one that I miss the most, was our ability to laugh at ourselves and each other. This added such joy to our union. It was the foundation that supported us through joyful and difficult times. 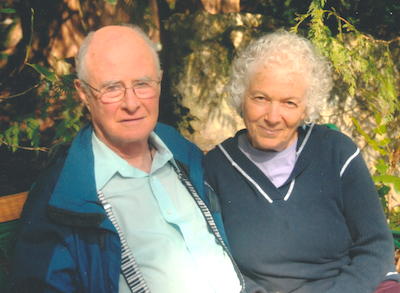 The last photo taken of Alan and Phyllis, April 2013. Our strong love for one another carried us through the difficult years when Alan’s health began to fail. In November 2011, Alan was diagnosed with both Alzheimer’s disease and laryngeal cancer. The cancer healed in four months, using alternative modalities of naturopathy, community prayer and visualization. (How Alan Healed From Cancer in four months). When the Alzheimer’s noticeably got worse, we sadly and courageously faced Alan’s choices. He could live into the late stages of Alzheimer’s and most likely end up living in a dementia facility. Or, with the support of Compassion & Choices of Washington, we could explore the alternative choice of him voluntarily stopping eating and drinking (VSED) when he was in the middle stages of Alzheimer’s, while he was still mentally competent. He courageously chose this choice. Six months before he died, while he could still speak fairly well, and at his request, we held his Celebration of Life.